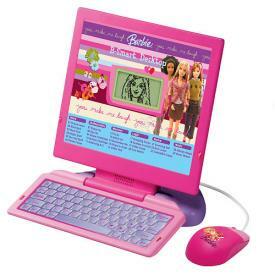 My Family Fun - Barbie B desktop Chic and cool for the sophisticated computer girl! Chic and cool for the sophisticated computer girl! The fold down keyboard keeps everything together. Includes magical music while the voice of Barbie encourages the child as they have fun and learn. Up 20 activities, spelling, vocabulary, logic and more.